Slough Jets and Manchester Phoenix met up for the final time this regular season with the last clash taking place on Hangar ice. Andrej Vasiljevic started in net for the home team but with a powerplay opportunity coming at 12.55 Danny Milton took over. Ales Padelek finshed from Kamil Tvrdek and Matt Towalski for the opening goal on the powerplay, Vasiljevic returned to the net and the first period played out ending 1-0. It took just 46 seconds for Robin Kovar to level the game in the second period when he finished from Andy McKinney. Jamie Line completed from Ryan Webb at 28.07 to make it 2-1 but the visitors swung the game in the final three minutes of the second period. 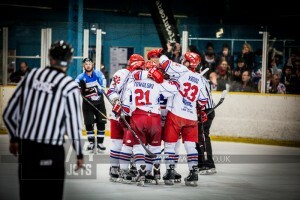 Michal Psurny scored at 37.16 to equalise and with 51 seconds left James Archer scored the game winning goal. Slough tried valiantly in the third period to open up and attack but Psurny’s second at 52.27 swung momentum to the visitors. Tony Hand took Manchester’s time-out at 55.59 and Kovar found the back of the net with 3.10 left to play for 2-5. 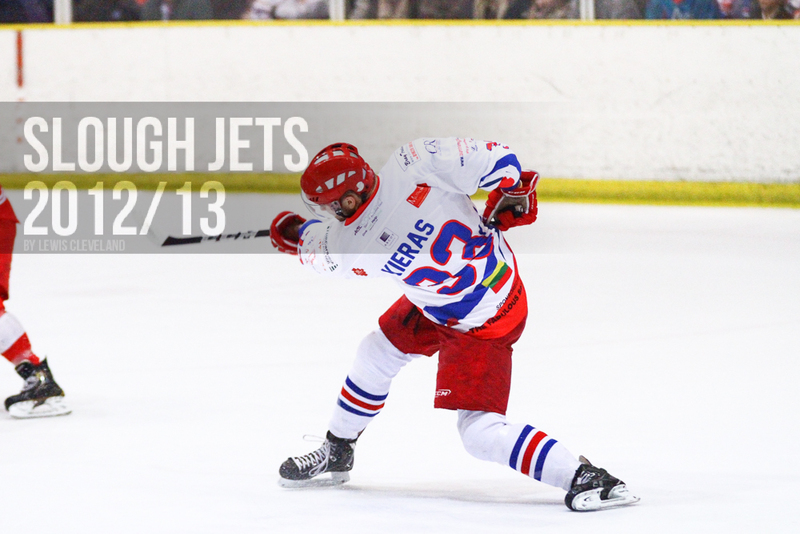 Slough Jets hosted the 1st leg of the Premier Cup Semi-final against top placed qualifiers Basingstoke Bison at the Hangar. Both teams took to the ice missing personnel through injury and early on in the first period a big save from Stevie Lyle denied Tomas Valecko the opportunity to net the opener. The physical side of the game shone through but at the end of period hooter the score remained 0-0. The second period saw the scoring finally get underway and it was special teams that produced the opening goal when Frantisek Bakrlik seized on a lose puck to finish some great work by the team and beat Lyle for the first time in the night at 34.56. The same player netted again 1.02 later with a wrist shot after holding off two defenceman to make it 2-0 and Basingstoke took their time-out. The home team held their lead until the buzzer and took the second break two goals ahead. Basingstoke enjoyed a positive start to the third period as Greg Chambers pulled them back a goal with Slough just returning to full strength but Michael Wales slotted a pass along the wing to Darius Pliskauskas who centred to Dan Davies who made it 3-1 at 45.49. There was no further scoring until 58.08 when Greg Owen scored for Basingstoke but the visitors couldn’t avoid defeat on the night meaning Slough take a goal lead into the second leg in February. Slough Jets new signing Pavel Gomeniuk made his debut as the Swindon Wildcats started a home and away weekend series on the Hangar ice. Slough were without Dan Scott and Aaron Connolly both missing through injury and at 10.53 were down by a goal when Jonas Hoog scored past Gregg Rockman in net for the home team. At 14.56, with Joe Baird in the penalty box, Tomas Fojtik netted a shorthanded goal to make it 0-2 at the first interval. Slough came back out re-charged in the second period and at 25.30 a speculative shot from James Hutchinson found it’s way past Dean Skinns in the Swindon goal for 1-2. Ryan Aldridge then put up a powerplay goal to restore the margin to 2 goals at 34.14 but Frantisek Bakrlik netted on a 5 on 3 advantage at 38.37 making it 2-3 and leaving all to play for in the final period. Slough vastly outshot their opponents and played the more attacking hockey in the final period but despite 3 powerplay opportunities time ticked away and the margin remained the 1 goal. 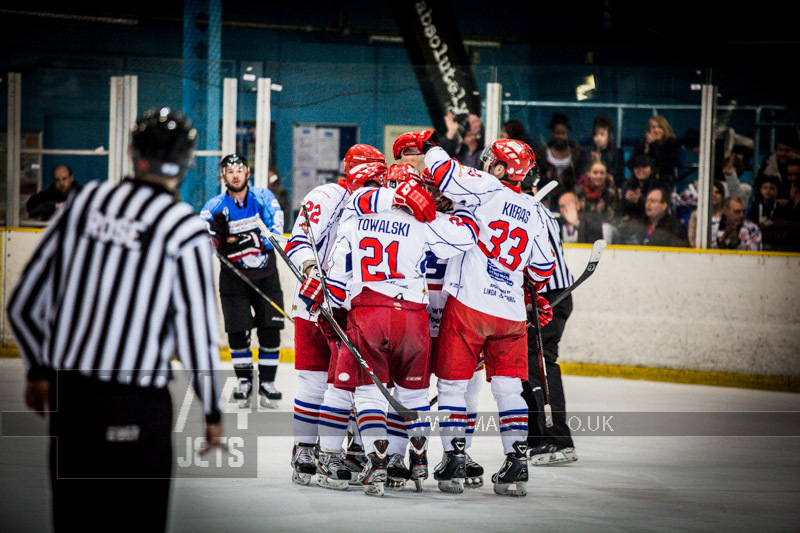 Slava Koulikov called the Slough time out at 58.14 and at 59.10 with Slough pressuring hard in their attacking zone Rockman left the net for the extra attacker but a turn over allowed Hoog and Bullas to combine to net into the empty goal at 59.26 to secure the win. Slough and Peterborough exchanged shots in a scoreless opening period but it was the visitors Damien King who was the busier of the netminders. 198 seconds in the second period Aaron Connolly opened the scoring with the home teams first goal and at 24.50 it was 2-0 when Dan Davies found the back of the net. Just after the half way mark Darius Pliskauskas made it 3-0 when he netted at 33.22 and Slough took the middle period 3-0 with 3 of their 7 shots being successful. Peterborough made a good start in the third period when Ondrej Lauko scored at 40.31 and when he netted his second at 47.50 the deficit was narrowed to just a goal and Doug Sheppard called the home team time-out. A rejuvenated Slough battled on and with 4.39 remaining Connolly scored his second of the night to make it 4-2. Davies ensured the win with his goal at 56.20 and the visitors were left with no points. Slough Jets welcomed Telford Tigers to the Hangar for a league fixture to start the weekend. Joe Greener got the scoring underway at 1.53 and Slough set about dominating the opening period. Doug Sheppard doubled up the lead at 9.10 and Slava Koulikov made it 3-0 at 12.28. Scott McKenzie pulled a goal back shorthanded at 16.08 but Shaun Thompson converted the powerplay at 16.30. Dan Davies completed a 5-1 opening period with just 19 seconds left. Slough changed netminders at the start of the second period as Ryan Bainborough replaced Gregg Rockman. Scott McKenzie scored another goal at 28.40 making it 5-2 but Darius Pliskauskas netted at 34.22 and the second period ended 6-3. The third period ticked down with both teams managing 15 shots on goal and the only goal came from McKenzie, completing his hat-trick at 54.58. 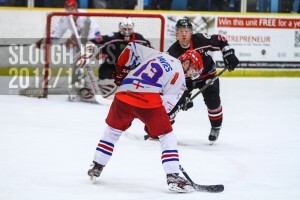 Slough Jets debuted new signing Andrew Munroe as they faced their nearest rivals, the Bracknell Bees. Slough set out to dominate the game from the opening face-off and in truth only Ambler in net saved the score for spiralling. Peter Jasik scored on the game’s first powerplay at 11.20 to put the home team ahead before Jaroslav Cesky managed the visitors only goal 181 seconds later. Jan Melichar became the second former Bracknell player to score against his old team at 17.45 when he sent Slough to the interval 2-1 ahead. The second period was more of the same as Ambler faced nearly three times the shots faced by Gregg Rockman but again he kept his team in the game. Michael Bowman made it 3-1 at 24.48 but despite the teams trading powerplays through the period that was the end of the scoring. The final twenty minutes carried on from where the first forty minutes had left off and Slough dominated the attacking. The visitors refused to give up and recorded seven shots on goal through the period. Claude Dumas took Bracknell’s time-out at 59.19, coinciding with a Slough penalty and finished the game with the empty net pressing hard at 6 on 4 but couldn’t beat Rockman and Slough’s defence.